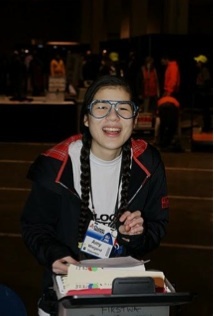 Amy first became interested in computer science after becoming a member of the FIRST Lego League Team in middle school, and the interest grew from there. She is an active member in FIRST Robotics, and she recently went to the world finals in Atlanta, Georgia with her team for the second year in a row. She is proud of her thorough understanding of CAD and her ability to teach others about it, as well as her ability to program using Labview. Amy interned at Autodesk during the summer of 2011, and while she was there she worked with the CAD programs to find errors and identify what changes should be made for the next release. Amy has helped mentor and lead several LEGO Robotics teams, is a member of the National Honor Society, Science Bowl Team, Programming Olympiad, and the Science Olympiad. She aspires to go to college to double major in computer science and mechanical engineering in order to pursue digital design engineering, coding, or software engineering. Future: Going to college to study either robotics, computer science, artificial intelligence, or some sort of engineering. She also sees herself continuing to teach classes and mentor my peers in robotics and programming. Interesting Facts: Amy fences at Northwest Fencing Center, studies ASL (American Sign Language) at the local community college, participates as a member of the Riverdale Science Club, and volunteers at the local library. She enjoys the mere challenge of solving new problems, learning new facts and the feeling of accomplishment when you share that with others.